There is among people fans to grow in their gardens and cucumbers, and tomatoes. But, planting these crops in a greenhouse, no matter how they tried, will not get a crop neither one nor the other. Why is this happening? Every cottager your site, someone big, someone small. But very much want to place all your landing even on a few acres. And lovers of villas and gardens are trying to grow under one roof, and cucumbers, and tomatoes. But in the end have nothing but wasted time and effort. As a result of this cultivation comes only disappointment. Why not grow one in the greenhouse the tomatoes and cucumbers? There are several reasons. For these cultures there are different rules of farming, and they have different growing conditions. For tomatoes needed more dry air with high ambient temperature. In addition, these vegetables are even easier to tolerate a little drought than waterlogging. These plants require regular airing of greenhouses, which contributes to pollination. At high humidity (over 70%) of the plants can catch fungal and bacterial diseases. And such a lot. A sick plant is not always possible to save. High humidity contributes to the abscission of flowers. Not occur in the normal pollination and fertilization that result in fruits not. Pollination does not occur due to the fact that wet pollen is not getting enough sleep on a flower male plants. Cucumbers, unlike tomatoes, like the more humid the air and the soil. For them in the greenhouse set almost 100% humidity. Under such conditions, these vegetables I feel great. If these plants do not have enough humidity, the leaves begin to wither and dry.Drafts cucumbers do not like, so they are contraindicated in airing. Drought these plants suffer badly. They have a small root system and from deeper layers of soil, they cannot produce their own moisture. Therefore, they receive only irrigation water. 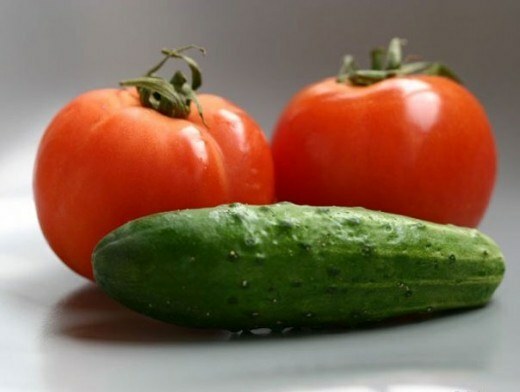 If from time to time to give necessary for proper growth and development of the cucumbers, will suffer from it on tomatoes, as, for example, the high humidity they just simply killed. And if you provide those conditions that require tomatoes, ill have cucumbers. For example, if rapid change in temperature the plants are weakened and stunted. In order not to lose neither his time nor strength, it is better not to experiment with the joint planting of these two crops in the same greenhouse. Therefore, when farming, it is recommended to take them to a separate place on the site. Advice 2 : Is it possible to put in one greenhouse cucumber and pepper? Spring is in full swing, which means very soon the farmers will start sowing horticultural crops, transplanting. For experienced gardeners this is a simple process, as they know all the nuances of planting and replanting. Several it will be difficult for those who first decided to grow their crops. Start transplanting of cucumbers in Central Russia in mid-may, because at this time, often, night is no frost. As for the distance at which the plants should be from each other, it depends on the varieties of cucumbers, and method of planting. Based on the foregoing, we conclude that the distance between the cucumbers can vary between 40 and 60 centimeters. And the vertical method of planting the optimum interval of 40-50 cm, and in horizontal - not less than 60 cm Even if you have a fairly large garden plot and you have the opportunity to select for cucumber wide bed, choose the vertical method of planting, as in this case, you will get a bigger crop of cucumbers. The scheme of planting tomatoes depends on the cultivar, the formation of the stems and leaves of plants. To obtain the maximum yield of tomatoes, not too sagomate, as otherwise they will not have enough sunlight, humidity exceeds all norms. 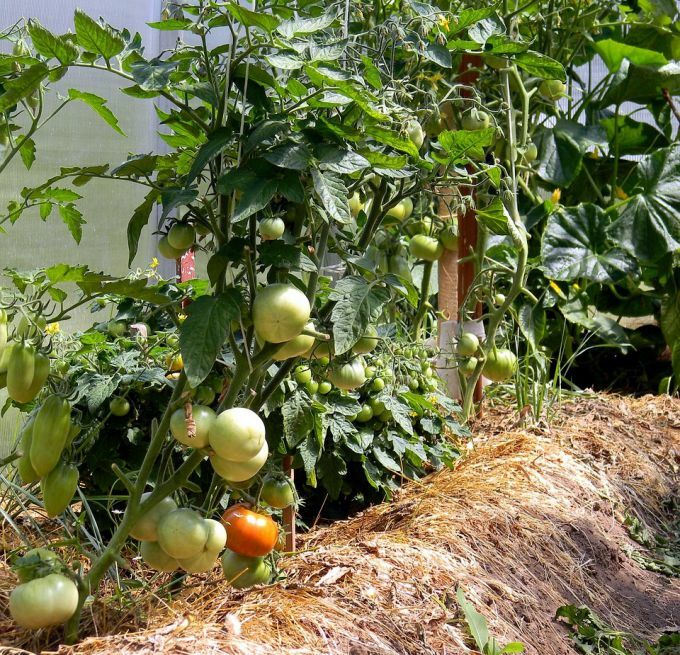 Common recommendations method of planting tomatoes is not, however, considered that the best way upsetting mid-season low-growing crops (these include varieties of "Pink leader", "Dachnik", "Fontanka", etc.) - a chess. The plants are thriving and give a good harvest when planting them in two rows, distance between rows, and by the tomato - 50 centimeters. The mid tomato varieties stambenih (undersized Slavovitsa "bullfinch", "Dominator" etc give a good harvest and a very small area. For example, such varieties can be planted 25 cm apart, in rows at a distance of 50 centimeters. One thing to consider with this method of planting seedlings require more careful care. Indeterminate tall varieties of tomatoes should be planted at a distance of 60 centimeters from each other when the width of the rows is 70-80 cm. Data classes include "the tower", "Start 1" and other. Peppers - pretty warm-weather crop, so in an average strip of Russia it is better to grow them in greenhouses and greenhouses. 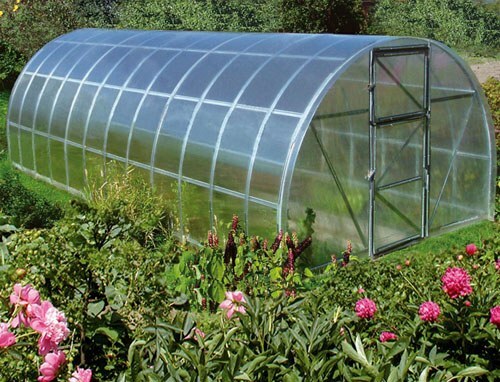 The width of the beds in the greenhouse should be within one meter (to make it easier to loosen the earth and to water the plants). As for the method of planting when growing peppers, giving a small fruit, plants can be planted at a distance of 20-25 cm from each other, in other cases at least 40 centimeters. In General, peppers are very fond of "freedom", so if you have the opportunity, not thickening landings. In the future you will be easier to care for plants: water them, fertilize, loosen the earth.